This volume discusses the Hero’s Quest as developed by Joseph Campbell, the famous mythologist and allows the reader to follow the journey of Prince Ailani. Southern California and Hawaii have many things in common: Surfing and surfers, the Pacific Ocean shaping the consciousness of the people who live in both places and a carefree lifestyle because of the mild weather. What Hawaii alone has, is an exotic and ancient culture that is centuries old and was built around a naturist religion, much like those of the native people of the Americas, with animal spirit guides, human life force connected to the earth’s life force, powerful high priests and legendary kings and queens who ruled the islands of paradise along with great heroes who performed feats of bravery in times of need. 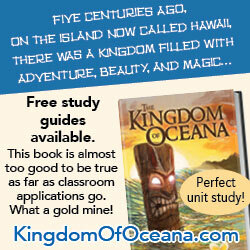 The ocean’s presence and power is one of the main characters of the story and in my estimation, Charles Mitchell has created a wonderfully intelligent and entertaining novel that teaches an overview of the ancient Hawaiian world while weaving a tale of a hero’s Quest a la Joseph Campbell. The story revolves around two teenage brothers, royal princes, only one of whom can be destined to reign as king someday. They maintain a constant rivalry about virtually everything – racing, swimming, etc. The younger one of them is kind and more thoughtful than the older, who is a person of impulsive action, attracted to power and possessing a bullying mentality. They discover an abandoned and very ancient fortress that holds a magical Tiki mask of power. The older brother, Nahoa, is entranced with the Tiki mask and what its power can afford him. More fearful and thoughtful, the younger brother prefers to avoid the Tiki’s power and he follows a Hero’s Quest throughout the book, with help from his spirit animals and helpful humans, keeping true to his kind nature and refining it as he progresses. The story is simple, but archetypal in itself. You might want to read it aloud to your child so you can gain the pleasure of reading it as well!